Since I’m not using a mouse, I must admit to very much missing an equivalent of the Scrubby Zoom Photoshop functionality. I don’t know if something similar could be added some time in the future, but I think it would help a lot. Nice idea. Any other things to make non-mouse users happy? Totally. I tend to loose precision while drawing and pressing the pen button, so drawing while holding down a key for the second colour would be much appreciated. Still, of all I’ve seen and tried so far, scrubby zoom is by far my most wanted functionality, zooming in and out all the time when doing pixel art. I added the shortcut for the second color mode now (though it was not your main request, but it was planned for the release anyway). Scrubby zoom is probably added soon. 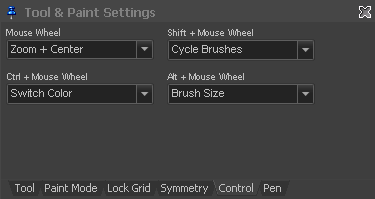 With the upcoming release you can define different mouse wheel actions when holding Shift, Ctrl or Alt and using the wheel. It could be possible to make all this work with the pen, but there is the difficulty to get the pen into the mode that a stroke is interpreted similar to mouse wheel (stroke length/direction = wheel movement/direction). Would it make sense to hit a key which turns into a kind of tool with which you tip and move to do the “wheel movement”? You could then use any of the actions as if you had a mouse wheel and this also applies to zoom which should then be like the Scrubby zoom. If I understood correctly, holding down a hotkey would turn pen movement into mouse-wheel emulation. Moving the pen to the left, every X points, would decrement the mouse wheel and zoom out, and moving to the right, every X points, would increment the mouse wheel and zoom in. Or something like that. Surely less fluid than the PS scrubby zoom, since it would happen in jumps/increments, but nevertheless and great short-term compromise for having something similar. Important, IMHO, is that the user is returned to the active tool on releasing the hotkey, and not having for ex to have to press D to return to drawing, since this would pretty much eliminate the advantage of having the scrubby zoom. Good news too about the second colour shortcut. Thanks. Holding a key won’t work because you need to be able to hold Ctrl or Shift or Alt to select from extra options. Click somewhere onto the canvas and drag to create a “stroke”. Maximum distance from the starting point to either x or y defines the mouse wheel change. Releasing the mouse button jumps back to the tool you had before and the operation is done. Don’t know if it will really work but in theory it could.